According to a small business report, 50 percent of companies in 2016 say that hiring is the toughest challenge they face. With 50 percent of businesses hiring, this means your dream job awaits. 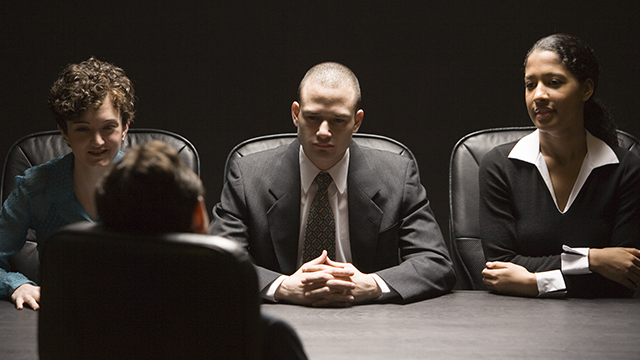 Now, it's time to prepare for the interview questions that trip up even the best of interviewees. Despite all of your preparations, a job interview is a nerve-wracking experience. To make matters worse, interviewers have numerous questions that can easily catch the interviewee off guard. These questions are not meant to be malicious. They’re used to get a better understanding of the candidate to make sure that they’re qualified for the job and can be a solid fit for the company’s culture. Over the years, I've hired hundreds of people and interviewed thousands of job candidates. As someone who hires, throwing you off your game is how I can see how you might perform under pressure in the workplace. No matter how experienced or prepped you are, at times, these questions are bound to trip anyone up. If you want to prevent any fumble, prepare a few responses to tricky questions like the following 11 examples. This sounds like an innocent and straightforward question, but it can trick you into diving too much into your personal life. Even though great interviewers use conversation to determine culture fit, you want to focus more on your educational background, career and recent job experiences. How to answer: Don’t discuss your family or hobbies. Stay on-track by sharing how you can bring value to the organization. On one hand you want to convey your dedication to your work, as well as assuring the interviewer that you're available and reliable. On the other hand, you also want to make it known that you know the value and importance of work-life balance so that you don’t get burned out. How to answer: Let the employer know that you are 100 percent committed to your work. However, let them know that you also need time away from the office. Make it clear that you will have all of your responsibilities completed before you leave for vacation and that you may be contacted if there is an emergency. Keep in mind, if you're like Elon Musk or myself... the answer I'm really wanting may be a little different as I'm running a startup and really want my team working 24/7. If we're not working harder, faster and longer than everyone else, we will lose the race. This question is intended to find out whether or not you really care about this job or if you’re just going through the motions. How to answer: Demonstrate that you took the time to research the company and industry prior to the interview by sharing information like the company’s background or mentioning the trends occurring in the industry and noting how you can make a positive difference. To give you an example of the last person I hired, when I asked this person, he began to describe our ecash product. He went into a level of detail that even I didn't know. He also pointed out three potential problems that neither I nor my team had thought about. That is being very prepared for the question. I personally fell into this trap when I was younger by responding that I would like to continue my education so that I could move on to a better position... in a completely different industry! After six months, I was let go. Not because of my job performance, but because the organization felt that I wasn’t going to be around in the long-run. How to answer: Companies don’t want to invest in an employee who isn’t planning on staying around, it's not typically in their business plan to hire people short term. While you don’t have to lie, answer this question honestly by saying that you’re looking for a job that is challenging and that you’re passionate about, along with your future goals. If you believe that this position fits those needs, then explain how the organization can help you reach those goals. Responding with the cliché answer of, “I’m a perfectionist” is a phrase that interviewers hear all the time and are usually turned off by. Not only that, it doesn’t explain how you take the steps needed to become a stronger employee or how you overcome obstacles. Again, this is a question that shows your interest in the job, as well as showing that you’ve done your homework and are a fit for the company’s culture. "I've known several colleagues over the years who have worked at your company, and they have all said great things." "Your company's Facebook page is really engaging. I love how you [fill in the blank]." "Your company is known for making great products that help people do X. But on top of that, I know of your company's leadership role in our community through your support of X, Y and Z events or causes. Your products and philanthropy show you to be a company that cares about both the bottom line and about giving back to society." If you state that you like to work alone, then you may come across as too much of loner that does their own thing. But, if you respond by saying that you prefer working only in groups, then you may seem like an individual who can’t make independent decisions. How to answer: You should state that you enjoy both types of work relationships. List the pros and cons of each kind of work. For example, working in groups allows you to learn new skills and exchange ideas. However, you also like the freedom to work independently so that you can get tasks done more quickly and without interruption. Don’t use this as an opportunity to badmouth your former employer or company. That will raise red flags when the interviewer contacts your references. How to answer: Be truthful and honest. Don’t focus on the negatives. Instead, detail what you learned from your previous employer or how the experience helped you grow. The reason that you left, however, was that it was time to explore new opportunities or push yourself out of your comfort zone. This is a question that is intended to test your ethics and morals. The reason that it can get tricky is because it could lead you down a path where you could badmouth your former employees or employers. Even worse, you could accidentally share sensitive information, such as the internal practices of your former company or parts of a private investigation. How to answer: Be honest, clear and concise. Most importantly, remain a professional by not sharing any private information regarding your former employer. This question can make both parties feel uncomfortable. Furthermore, the interviewer may not have the power to negotiate or discuss your salary. The reason that this question is asked is because the company wants to be sure that they can afford you. Question: What salary range are you looking for? "Let's talk about the job requirements and expectations first, so I can get a sense of what you need." That's a soft answer to a soft way to ask the question. Question: What are you expecting to make in terms of salary? "I am interested in finding a job that is a good fit for me. I'm sure whatever salary you're paying is consistent with the rest of the market." In other words, I respect myself and I want to believe the company is respectable. When answering any of these questions above, be yourself and don't try to be something you’re not. It'll come out eventually. Be true to the person inside yourself. If an interview doesn't go as well as hoped, maybe it's not meant to be. I once interviewed 26 times with 17 companies before I got a job. I was about to break but kept going. You can do this. Keep going and don't give up.